Broad spectrum miticide and insecticide. Contains rosemary and peppermint oils PLUS Geraniol. Keyplex Ecotrol Plus controls pests such as, but not limited to: mites (see section 3.1), aphids, beetles, thrips, whiteflies, caterpillars, and mealybugs. It can be used as a an effective standalone product, but is often used in a tank mix with other pesticides. When tank mixed it improves the efficacy of other contact pesticides by acting as an “exciter”; its odor confuses insects and causes them to move around on the plant. Ecotrol Plus can be used in conjunction with TriTek against disease vectoring insects. When used against disease-vectoring insects that can transfer disease with only a few minutes of feeding (ex – whitefly in squash, tomatoes; beet leafhopper in tomatoes, peppers), it is recommended to use this combination every 3 days while whitefly is present. Keyplex Ecotrol Plus is registered for use in most states. See full list here (bottom of page). Keyplex Ecotrol Plus can be used alone but is often used as a tank mix with oils and insecticides. 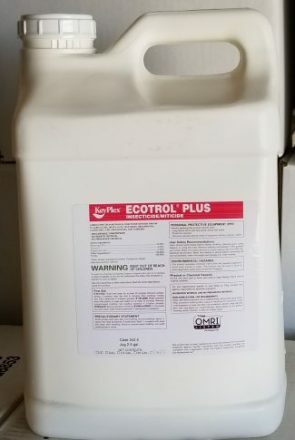 As part of a tank mix, Ecotrol Plus may cause excessive movement of insects and confusion of insect sensory mechanisms, thus limiting feeding activity and enhancing activity of other contact insecticides. Ecotrol Plus has a very pleasant smell due to its composition of essential oils. The combination of Brandt TriTek and Keyplex Ecotec Plus can be effective in preventing the spread of diseases by insect vectors. This is especially true in the case of viral diseases, where only a few minutes of feeding can be enough to transmit the disease. The full leaf surface coverage of TriTek along with the sensory confusing effects of Ecotrol combine to reduce feeding significantly, thus limiting infection of the crop.